In July 1830, Neil MacKenzie, a handsome, young Glaswegian minister, takes up a post on a remote island in the Hebrides, joined by his new bride, Lizzie. St. Kilda, also known as Hirta, is a harshly beautiful place. The islanders live in ancient hovels knee-deep in filth, and they subsist on sea birds such as puffins and gannets, and what poor crops they can coax out of the thin soil. St. Kilda, Outer Hebrides (Public domain; courtesy urbanghostmedia.com). But it’s not the poverty that draws Neil MacKenzie, though he believes that his calling lies among the humble. 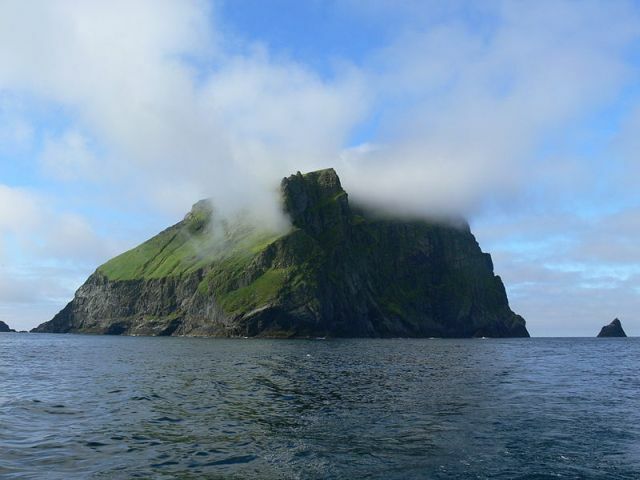 It’s that the St. Kildans, having lived with pagan lore for centuries, and (as he and his church preceptors believe), knowing nothing of Christian civilization, they offer the test he’s been seeking. Can he, through faith, force of character, and energy, lead them onto the true path? As a consequence, a zealous vision of grandeur takes hold of him. He’s quick to put himself and his task in the center of everything that happens, a further reflection of his test. And therein lies the tension, because despite his herculean efforts, he can’t pull everyone along with him, least of all his long-suffering wife. Lizzie, though isolated by shyness and a language barrier–unlike Neil, she doesn’t speak Gaelic, the only tongue the islanders understand–gradually learns more about the St. Kildans than he does. These people are poor and illiterate, but they’ve developed a social organization that makes decisions through consensus and strives to reduce conflicts over envy and greed (so much so that mainland dilettantes condescend to visit and pronounce the St. Kildans noble savages). Lizzie doesn’t go so far as to assume that the islanders are civilized, but she does recognize that her husband is trying to alter a way of life of which he knows nothing except his own contempt for it. Further, she realizes that telling people the Lord will provide may sound empty, when they helplessly watch their infants die of a horrible, wracking illness, and where hunger is common at least half the year. Winter followed autumn almost unnoticed, in the same way that dusk was merely a darkening of each bloomy day. The island was thus empty of life, and the fierce Atlantic gales that swept across the crags and glens week after week, month after month, increased the isolation of the couple in the manse. When their need for closeness and their longing to be loved was too great they would sneak around each other like cats around a plate of hot milk snatching at tenderness. Three sentences describe a man’s greatest character flaw, the inability to admit vulnerability. I understand this type of character too well–I grew up with people like that–so I empathize with Lizzie and how she suffers, which is why I didn’t put the book aside. The themes Altenberg has chosen, of isolation, cultural clash, and social blindness, strike a chord with me as well. Nevertheless, Island of Wings could have been a very good novel, not just an “interesting story,” and I hope that in her next effort, Altenberg puts it all together.